Centre of Excellence in Additive Manufacturing and Reverse Engineering at KLSGIT to cater Industry, Students & Researchers. Indian Industry increasingly adopting automation and digitization, this requires highly skilled and well-trained workforce in future – ready technologies & processes. To meet this requirement and to train the students to become industry ready engineers and to help manufacturing industry, with the help of Karnataka Council for Technological Upgradation (KCTU), KLS Gogte Institute of Technology (GIT) established Center of Excellence in additive Manufacturing & Reverse Engineering. 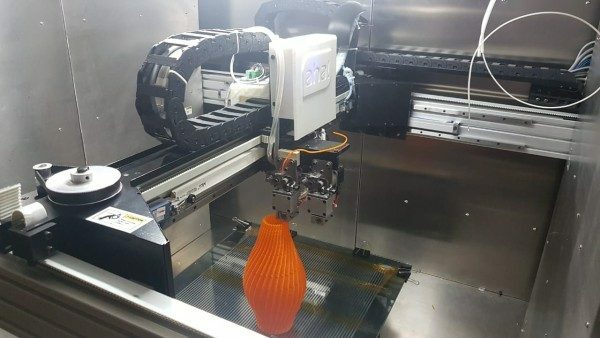 Additive manufacturing (AM) is also generally known as 3D printing, is defined as the process of joining materials to make objects from three-dimensional model data, usually layer upon layer, as opposed to subtractive manufacturing methods. This facility is the first-of-its-kind in this part of Karnataka, services offering for students, researchers and additive manufacturing (AM) industry. Additive Manufacturing/3D printing processes are increasingly becoming part of industrial production chains. This is especially true in safety-critical areas such as aerospace, medical technology and automotive industries where demanding standards apply. The biggest challenge is to prove the absolute reliability of 3D printed parts. While 3D printing tends to get all the glory when it comes to news headlines and discussions about innovative technologies, it is actually 3D scanning that currently has the most practical applications. There is a close and complementary relationship between the two, in part because one is essentially the reverse process of the other. Additive manufacturing brings a digital concept into the real world, while 3D scanning converts a physical object into a digital format. Aside from that, it also used nowadays to verify the accuracy of the actual 3D printed part from the nominal. These are a few of the numerous benefits that we can get from the latest sensor technology. Center of Excellence will address critical gaps in the industry as well as to guide students and researchers through four key areas. First, it will provide advanced training curriculum to speed up adoption and readiness of a strong Additive Manufacturing workforce. Next, the center’s validation programs will address AM material and process qualification. Third, the center’s advisory services will provide best practices on AM fast to production and AM part acceptance. Lastly, research will be conducted at the center to inform advanced developments in the respective field. It will help to promote Industry Academia interfacing, to give training to improve employability, to create a pool of skilled manpower catering the industry need. The concept is equally applicable to all branches of engineering from all the years of UG / PG programmes. Concepts like “outcome based education” and “experiential learning” are integrated into the activities of the center. The COE is jointly funded by Karnataka Council for Technological Upgradation (KCTU), Bangalore and KLS Gogte Institute of Technology, Belagavi. The COE has a Carl Zeiss Three Dimensional Scanner which helps capture 3D data of any object and convert to digital model. A Rapid Prototyping machine (FDM) which converts a CAD model to actual part and prints it layer by layer. To train the students to become industry ready engineers, as an add –on to the regular BE course, a 20 credits Honors/Minors courses in today’s needy topics have been introducing from this academic year, said Principal Dr.A.S.Deshpande. Later investigators have demonstrated the working of 3D scanner, 3d Printer and Rapid prototyping. • 3D Scanning and reverse engineering services. • On-Demand Training programmes for students and professionals in 3D scanning, 3D Printing and Rapid Prototyping.